Sharpened vehicle dynamics, optimum connectivity, operation via gesture control: Mercedes-AMG is updating the successful GLC 63 4MATIC+ models (fuel consumption combined: 12.4-12.1 l/100 km; combined CO2 emissions: 283-275 g/km) . 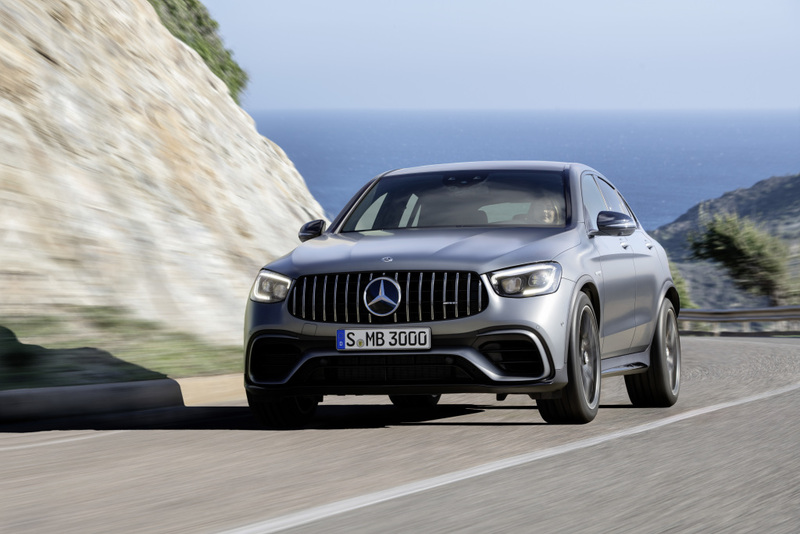 The SUV and coupé are being given a new, even more, distinctive light design as well as the MBUX infotainment system with AMG-specific functions and displays. The new dynamic handling control AMG DYNAMICS and the locking differential, which is now controlled electronically on all models as standard, facilitate even more versatile driving experiences. 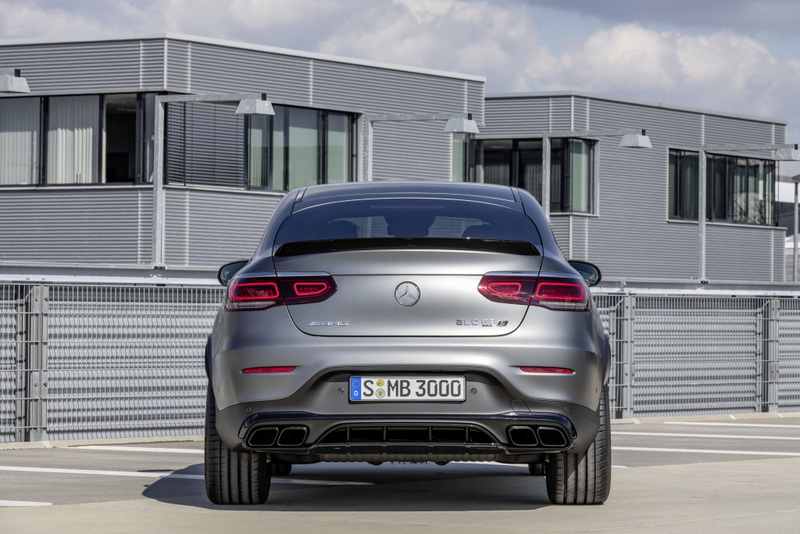 The SUV and coupé are also the only vehicles in the competitive environment to be driven by an eight-cylinder biturbo. Maximum driving pleasure is also ensured by the air suspension with adaptive damping adjustment, the all-wheel drive with fully variable torque distribution and the high-performance compound brake system. The mid-size performance SUV also offers plenty of space for passengers and luggage, a variable interior, extensive safety features and a high level of comfort on long journeys. With an officially measured and notarised lap time of 7.49.369 minutes, the Mercedes-AMG GLC 63 S 4MATIC+ (combined fuel consumption: 12.4 l/100 km; combined CO2 emissions: 283 g/km)1 is currently the fastest SUV in the world on the North Loop of the Nürburgring. 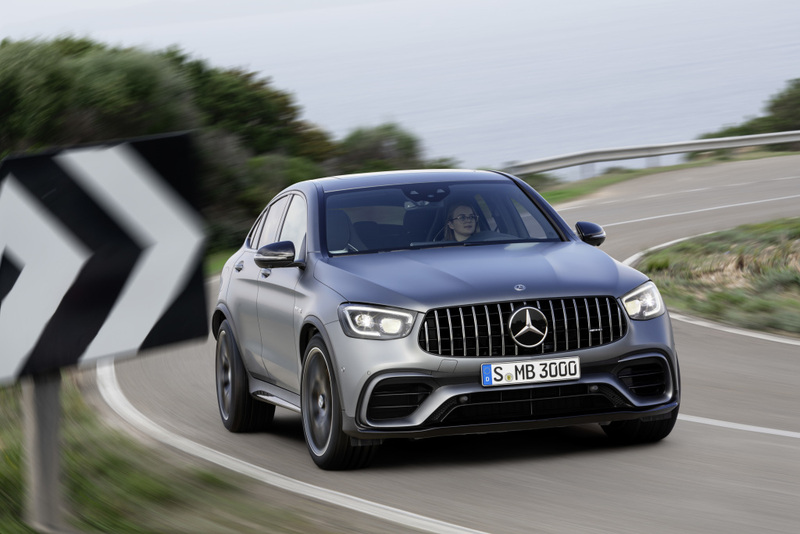 “The lap record on the North Loop has proven to the impressive effect that the GLC 63 is right at the top of its segment in terms of vehicle dynamics. With our V8 biturbo, we hold a decisive USP in the competitive environment. 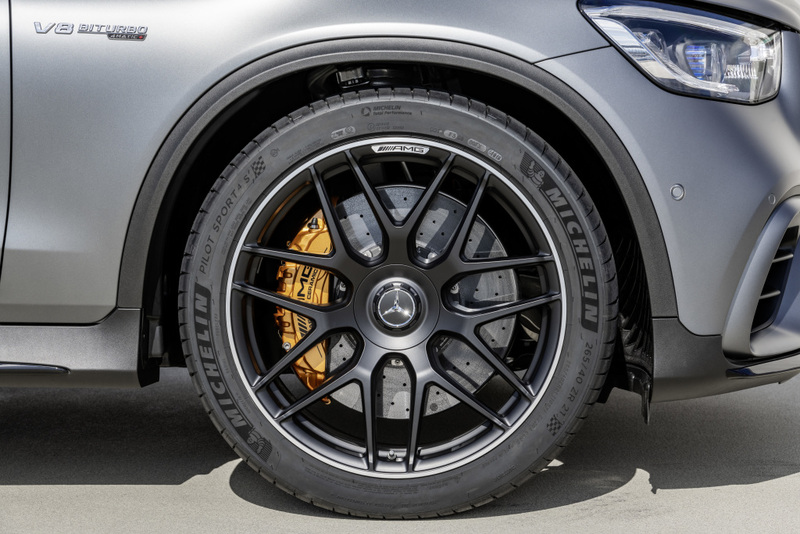 With AMG DYNAMICS we were able to hone the vehicle dynamics even more and also further increase the suitability for everyday use and the connectivity with MBUX. This makes the GLC 63 an all-rounder for every occasion”, says Tobias Moers, Chairman of the Management Board of Mercedes-AMG GmbH. 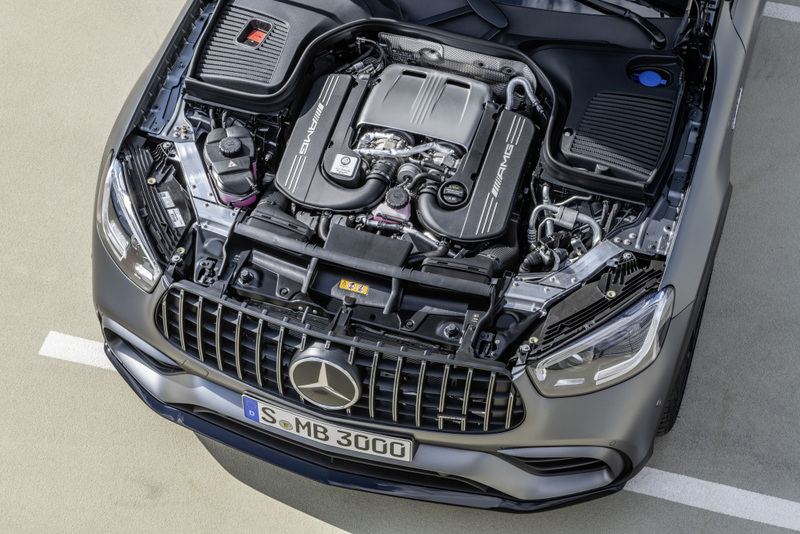 The SUV and coupé are available as base and S model variants: the AMG 4.0-litre V8 biturbo engine generates 350 kW (476 hp) or 375 kW (510 hp) with a maximum torque of 650 or 700 Nm. Acceleration from zero to 100 km/h is completed by the GLC 63 4MATIC+ in 4.0 seconds, the S models in 3.8 seconds. The top speed of the base model is 250 km/h (electronically limited, with the AMG Driver’s package 270 km/h), 280 km/h for the S models. The impressive driving dynamics are based, among other things, on the AMG RIDE CONTROL+ air suspension with adaptive damping adjustment, the electronically controlled differential lock, which is now also standard on all variants, and the dynamic engine mounts, which are part of the standard equipment on the S models. On the exterior design, the expressive front section with the AMG-specific radiator grille widening out towards the bottom and the vertical black louvres immediately catch the eye. The restyled flatter LED High-Performance headlamps to reinforce the visual presence with the flare look for the daytime running lamps. The wide front apron in a jet-wing design, combined with the large front splitter, emphasises the power of the new models. By dispensing with a fine-meshed grille, it gives a view of the cooling technology – a typical attribute from the world of motorsport and a further differentiation from the other GLC models. Wider wheel arch claddings at the front and rear likewise accentuate the dynamic appearance. With the new optional MBUX interior assistant, selected functions can be operated touchless and the reading light can be switched on and off. The advanced 3D camera system makes operation easier for the driver and front passenger through approach detection, illumination support and rapid access to favourites. To do this it evaluates hand movements in the area between the media display and touchpad. In practice, this means: as soon as the hand approaches the touchscreen or touchpad the MBUX interior assistant depicts certain control elements on the media display in enlarged form or highlights them. This applies to the menus of the home screen, radio/media, map navigation, Active Parking Assist and the seat adjustment. And needless to say, the trailblazing voice control activated with the words “Hey Mercedes” is also on-board. Thanks to artificial intelligence, MBUX recognises and understands nearly all sentences from the fields of infotainment and vehicle operation, even if they are expressed indirectly. The driver receives visual information via the 12.3-inch instrument cluster on the left and the 10.25-inch touchscreen display on the right. with the three AMG-specific display styles of “Classic”, “Sport” or “Supersport” it brings the vehicle functions directly to life. In addition, there is a digital display of the speed and the currently engaged gear. The manual transmission mode is identified by a yellow “M” and a prompt to shift up when reaching maximum engine speed, a touch inspired by the world of Formula 1. The interior underscores the leadership ambition of the new mid-size Performance SUVs in terms of driving dynamics. Driver and front passenger are enclosed as standard in sports seats in ARTICO man-made leather, combined with DINAMICA microfibre, which unites excellent lateral support with functional ergonomics tailored to the job of driving. Extremely sporty design, a grippy shape with a heavily contoured rim and intuitive operation are the key attributes of the new AMG steering wheel in DINAMICA microfibre, which comes as standard. It has a flattened bottom section and is perforated in the grip area. The galvanised steering wheel gearshift paddles allow an even sportier driving style with manual gear shifting. On the S model, the steering wheel comes as standard with a rim in Nappa leather/DINAMICA microfibre (optional for the base model). The AMG steering wheel is optionally available in Nappa leather with trim in black piano lacquer, DINAMICA all-round as well as DINAMICA with trim in high-gloss carbon fibre. 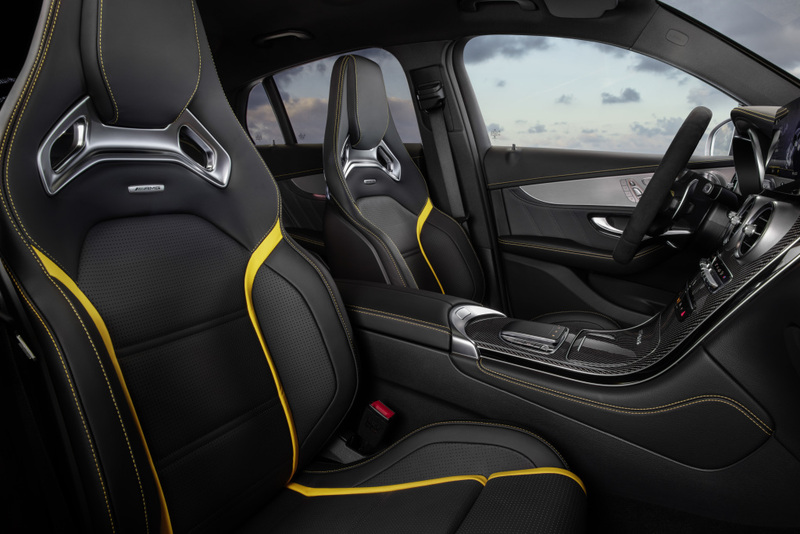 The optional AMG Performance seats provide optimum lateral support when adopting a dynamic driving style thanks to the special design of the seat side bolsters of the seat cushion and backrest. As an option, the seat side bolsters adjust perfectly to the body contours by means of built-in air cushions. The performance seats additionally lend the interior an even sportier character with their integral head restraints. The seat heating ensures pleasant seating comfort even at lower outside temperatures.